I have a friend who wants to join us, can we just let him share our room? Unfortunately, no. We are an ‘all inclusive’ Resort with many amenities, and allowing a friend to stay for free puts a strain on our resources. We have included an option to allow others to share your room for a reasonable fee, so do let us know before arriving. If you have already checked in and someone wishes to join you, inquire with us: perhaps we have a room or cabin available for them as well. As we continue to field various questions we will expand this list to include those items we hear more frequently. In the interim, should you have any questions or issues, please feel free to contact us. Yes, we provide WiFi free of charge to our guests, and it typically reaches all rooms and cabins as well as the Lounge. Actually, no. We prefer to keep things as natural as possible, and we find that most guests are only in their room to sleep at night. For those guests who would prefer AC, we have portable units for rent at a nominal, nightly fee. Besides the obvious, is there anything special we should pack? camera – the view and wildlife are extraordinary! As many of our guests favor a non-smoking holiday environment, we have introduced ‘smoking areas’ around the Resort. Please step away from others, and no smoking in any building (rooms, cabins, Lounge, Dome or under any gazebo, including in the hot tub, as per Ontario law). As well, please move away from doors and windows, as smoke can and will blow inside. Please help us to keep our Resort clean and natural: Use ashtrays and cans that are provided throughout the Resort for cigarette butts. If it is evident that there was smoking in a room (including bathrooms) a $250 recovery fee to cover the cost of restoring the room to a smoke free condition will be levied. We have an ATV/motor boat. Can we bring it with us? Sure, feel free to bring along your trailered leisure craft, but please respect the natural beauty that is Footprints. 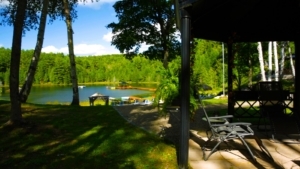 No motorized boats (including JetSkis) on our small lake, nor ATV’s on our property. 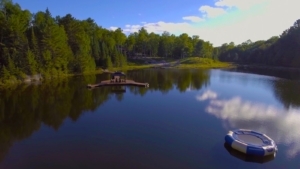 There are plenty of larger lakes that can accommodate your boat, and trails to ride on. Check out our links to ATV clubs. We are not a campground, but provide limited space for tents and small campers for those who prefer this option. There is one area that can accommodate several tents under dappled shade at one end of the property. 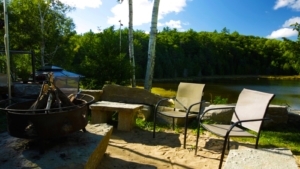 BBQ’s and picnic tables are available, and shared washroom is a short walk away. The second tent area is a flat, grassy area behind the room block, closer to the shared washrooms/showers. No vehicles allowed in this area. RV’s and trailers will be parked next to The Dome, and hydro can be provided if needed but to reduce the strain on the system, use your own energy source if possible (propane, solar, etc). No water/dumping. Dump station is up the road. How close is the closest store? Bancroft is a scenic 12 minute drive from the Resort, and has everything you could need: grocery stores, liquor and beer stores, restaurants (fast food, family/pub style and fine dining), pharmacy, police station, retail shopping, banks and even a hospital. No, we are a ‘self catering’ waterfront resort, which means bring your food with you and use our BBQ’s and kitchen to prepare your own meals. There are numerous restaurants, as well as grocery stores and liquor/beer stores in Bancroft, just minutes away if you’ve forgotten anything. Sorry, but no, Footprints is an Adults Only, 21+ resort and reserved for adults. Sorry, but no, pets of any kind are not permitted. Regretfully but Firmly. What happens if we can’t arrive until very late at night? For anyone arriving after dark, let us know by phone and we will leave a light on and the door open. 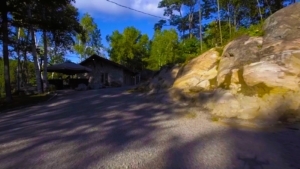 When you drive onto the property, follow the driveway in and to the right, park in the gravel parking area by the rock wall, and check in at the Lounge, the second building you see when arriving. You will be met there by your Host who will check you in, give you a tour and get you settled into your room. Check Out: By 11am on day of departure. Late departure may be available, check with staff 24 hrs before. 24 Hr Check In is available: Let us know in advance.